Help your child stand out on the pitch in vibrant style with the Optimum Tribal Velcro Kids 6 Stud SG Rugby Boots in Black and Blue. These quality affordable children's boots from Optimum has a flexible synthetic PU upper that offers water resistance and comfort to cope with a variety of game conditions. Instead of laces, these boots are fastened with velcro straps for fast and easy access, perfect for kids under pressure. With a design that includes tribal patterns, they have a unique look that won't go unnoticed during a match. Adapted for play on soft ground pitches, the welded sole features 6 removable metal studs that helps maintain a player's stability and traction so they can cope with whatever a game throws at them. 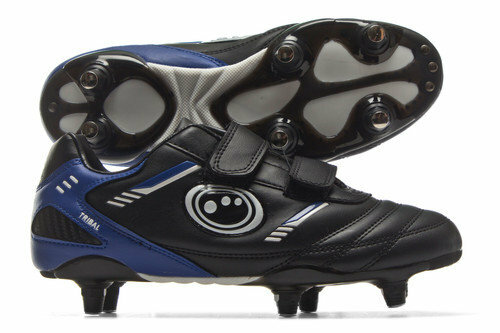 Treat your child so they can lace up the Optimum Tribal Velcro Kids 6 Stud SG Rugby Boots and leave their mark on the field with their unique eyecatching style.